Love is at the heart of everything the Salvation Army does, writes media officer Michael Tighe, whether it's helping the homeless, reuniting missing family members or supporting those dealing with addiction. So on this special day, here are three heartwarming stories from within our own ranks ..
Our first couple are none other than our Territorial Leaders, Commissioners Clive and Marianne Adams. Their story begins more than 24 years ago, when both of them were a long way from the office they hold now – not just in terms of time, but geography too. Commissioner Clive Adams was based in South Africa, and Commissioner Marianne was based in Norway. It began with a simple picture in a paper when he saw a picture of Marianne and decided, with some needling from a friend, to write to her. One letter was replied to, and then, quickly, the two found they were corresponding with each other – in the days before email – across two continents, several times a day, writing at all times, in all frames of mind. But there was reluctance on the part of both of them to get involved romantically. Following this particular hurdle, the next obstacle that Commissioner Clive had to overcome was the rules of The Salvation Army at that time – the couple had to meet, figure out a way to serve the organisation whilst based on two different continents, and serve out a six month engagement notice period before getting married. They arranged an extended holiday, and Marianne flew to South Africa to meet Clive, with no idea what she was in for. When the two met with Clive’s leaders in the South African Territory, they were advised to seek out a neutral territory, and to serve the six-month notice period before marrying. In this time they contacted the UK and Republic of Ireland Territory and prepared for their appointments hereIn the meantime, they continued to correspond to see out their engagement. They married and moved to the UK six months later, and progressed to become the leaders of the UK and Ireland Territory of The Salvation Army. Twenty-four years and two children later, they are still clearly as in love as ever, and let us in on their secret. Major and Major Ernest and Lily Ablett have been married for 67 years. Both officers in The Salvation Army, Ernest, 96, has been preaching for 80 years and Lily, 95, still visits lonely members of their community. Lily said: "I first saw Ernest when we were ploughing a field while I was out with a friend. I lived opposite a little chapel that I occasionally visited in Barnby, Suffolk, when I wasn't attending the church in Beccles with my parents and brother. My friend noticed that Ernest was due to preach in the chapel the next week so I went along especially to see him." Both served in the Second World War - Ernest spent four years in the Royal Norfolk Regiment mainly stationed in India, and Lily spent three years in the Auxiliary Territorial Service, the woman's branch of the British Army. She was initially a switchboard operator but soon moved over to play in the Army (military) band which travelled around the UK and into war torn areas of France and Italy to raise morale of the troops there. They married just after the war ended on 6 June 1946 and two years later signed up to train to be officers (ministers of religion) in The Salvation Army. They have served in Wales, North England, London and Essex, where they have now retired to. Lily's advice for a long and happy marriage is to give and take, and that arguments are normal. Ernest says simply: "Always keep to your marriage vows!" And their advice to Christians is: "Always trust in the Lord. If you are experiencing doubt, keep trying because the Lord will never let you down." 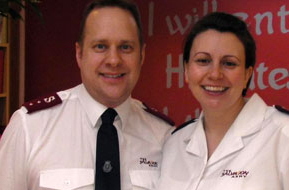 Stephen and Jo Moir are captains in the Cumbernauld Salvation Army and have been together for 16 years. They met while working at Booth House in Whitechapel, London – Jo was a project worker while Stephen was the deputy manager. The couple, who feature in a BBC Alba series called The Minister’s Wife, had been friends for a number of years before going on their first date. Three years later, in 2001, the young lovebirds tied the knot and now have two daughters, Grace (10) and Erin (7), with a baby due in the next few weeks. Jo smiled: “It’s been 13 years of married bliss. Seriously though, we get on really well. I think what makes us good together is that the same things are important to us.